Ardee Concert Band has had a long and illustrious history spanning 150 years, making it the third oldest band in Ireland. John Bradley (a local miller) formed the band in 1860. The instrumentation of the band was made up of fifes and drums, which cost £10 at the time, and a debonair red and white uniform completed the ensemble. Two of the original fifes are still in the town to the present day. This combination flourished for thirty years with marching engagements being the principal occupation in those early years. With the arrival of a German immigrant, Herr Von Rothe in 1890, the demise of the fife and drum combination became inevitable. He widened musical horizons in the area and under his guidance an accomplished orchestra was formed. Woodwind and brass were augmented as the occasion demanded and his genius spelt success for the orchestra. As time went on (probably due to a lack of good string players at the time) the emphasis turned more to that of a brass and reed combination. The band, became known as the Ardee Brass and Reed Band, with its full compliment of brass and reed instruments was formed in 1904 by Joseph Dolan, a very prominent citizen during those times. These instruments cost £75 which was quite a large sum of money at the turn of the century. Apparently, one of the first instruments to arrive by train was the bass drum. Such was the delight at it’s arrival, the drum was immediately paraded up and down the length of the town (minus the band) followed by a crowd of townspeople who clapped and cheered the full length of it’s inaugural parade!!! I guess there weren’t any traffic jams in those days!!! !With Herr Von Rothe as musical director, the band gained wide recognition, and travelled throughout counties Louth and Meath by horse drawn brake. With the departure of Von Rothe in 1910, the band suffered a decline, and it was not until 1923 that a revival took place. 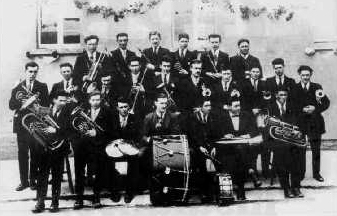 The earliest known photographs date back to this time (the photograph above is of the band in 1925). Some of today’s members can claim ancestry with these former members. Lack of interest in the mid 1930’s brought about a further decline but music was kept alive in the town by the formation of a boys brass band. During the Second World War the senior band was revived with every member joining the LDF (local defence force) and they had the distinction of being the only company in the country to have their own band. Tommy Byrne succeeded Paddy as musical director in 1965 but his term as conductor was tragically cut short when he was involved in a fatal car crash. Alfie Duggan succeeded him in 1966. Around this time, P.J. Regan from Dublin was appointed musical director. He saw the need for a more modern and better-equipped band and so in 1968 a fund-raising committee was formed with a view to complete instrumentation in all sections. This was done most successfully by a very dedicated and hard working committee, raising a total of £3,600. The benefits of having new instruments became evident in 1970 and 1971 with the band winning the national title both years under their musical director,P.J. Regan. Bad health and pressures of work brought about the retirement of both Alfie Duggan and Jack Regan around the mid 70’s, but the band continued however under the able leadership of Tony Flanagan assisted by Jimmy Nash from Drogheda. The most notable event around this time was a performance in Killineer for the visit of Pope John Paul II in September 1979. A lot of senior members had left by this time and an urgent need for new members became apparent if the band was to remain in existence. In 1980 a beginner’s class was established with section leaders tutoring new members on flute,saxophone, horn, trombone and percussion. Within a short space of time, all depleted ranks were once again full. Harry Kelly, from Scotland became musical director in 1982, and a decision was made to enter the National Band Championships during that year. The band came very close to winning the Intermediate Section with only a single point seperating the winners. Harry’s continual quest for the highest possible standard of musicianship from the band was to ensure victory in the 1983 and 1984 Intermediate Section and the 1985 Senior Section of the Irish National Band Championships. 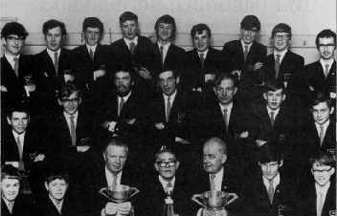 1985 also saw victory in the Senior Section of the North of Ireland Band Association Championships. As a result of these successes, the band were invited to take part in three PrizeWinners Concerts in the National Concert Hall in Dublin. The band now with full instrumentation changed their name to Ardee Concert Band. The next year in 1986, the bands biggest victory came when representing Ireland, in the Yorkshire town of Harrogate in England at the National Concert Band Festival. The band beat stiff opposition from all over the British Isles. Part of the prize was a commission for a piece written especially for the band by a young British composer, Brian Kelly. The work entitled Oxford Scherzo, received it’s world premier the following year (1987) in Croydon, near London. The band travelled to Manchester in 1988 to compete in this prestigious competition again. 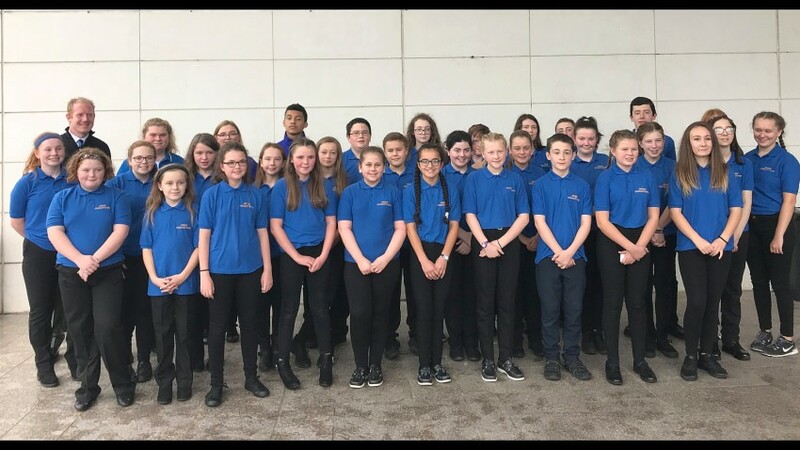 Although on these two occasions the band were not so fortunate, success came once more when they won the Advanced Senior Section of the National Band Championships in 1988, making them the top Concert Band in the country. The band continued to reap the rewards throughout the late 80’s and 90’s winning many competitions both national and regional. Throughout the 1980’s, the condition of the old bandroom in Bridge Street deteriorated. (This building was the old Irish National Foresters hall and the band had been rehearsing here since the 1950s, previously to that, the band had rehearsed in Ardee Castle) The band was now rehearsing twice weekly in the Community School. The committee were looking at the possibility of renovating the premises when the Bohemian Centre came up for sale. The band bought the Bohemian for £26,000 and sold the old premises. After a period in which most members worked very hard to paint and decorate, install heating and shore up the roof, the band started running Bingo. The band is very grateful to the people of Ardee who very generously donated £8,000 to the Bohemian Centre Renovation Fund. Now with a new home, the band developed into an organisation with over 100 members most of whom were under 18 years of age. With Pat Black as chairman, firstly the roof, side panels and stage were replaced at a cost of £92,000 and subsequently, an extension was built to provide dressing rooms, new toilets and a purpose built bandroom at a cost of £75,000. Many people will remember the very successful pantomimes that were held there in the early 1990’s. In 2004, the outside was painted and it is now one of the most impressive buildings in the town. In October 2005, work started on the extension to provide a second floor on the annex that was built in 1995. This provided a custom built bandroom and a recreation area where all of our members can gather in a safe, alcohol-free supervised environment. In 1993, the band travelled to the South of Ireland Band Championship in Clonakilty, and took first prize in a very competitive competition. From 1982 to date, the band has won first prize in 13 national competitions and been placed on 15 other occasions. 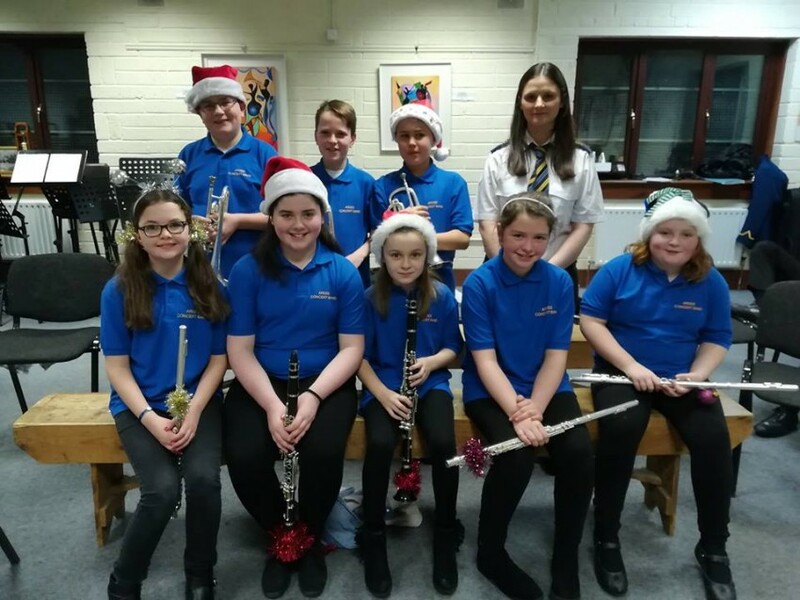 The band continues to provide virtually free music tuition to the young people of Ardee and area with the annual intake of members to the Recorder Group growing each year. The standard of musicianship has always been high and in order to maintain this standard, a School of Music was formed in 1999 with all members sitting the grade examinations of the Royal Irish Academy of Music. This has turned out some excellent musicians, some of whom have gone on to make a career out of music. The most successful annual event is the Annual Concert every December and with an audience of over 400 We may have to extend the Bohemian! The look of the band has changed over the years. In the 50s and 60s, it was a military style uniform with a jacket buttoned to the neck and a hat for marching. It changed in the late 60s to a black blazer, grey pants, white shirt and yellow tie and again changed in the late 70s back to a military style green jacket with gold trim, a hat, white shirt and green tie. The first outing for this green uniform was in 1979 when the band led by long time Staff Major, Paddy Ward, marched in the Grand Parade at the Ballinasloe Festival and Horse Fair and got rightly christened in the downpour during the parade. This uniform was very impressive and gained great praise when the band travelled to England in the 80s. The current uniform of blue blazer, black pants/skirt, white shirt and distinctive tie was introduced in 2003 with the first outing in Norfolk at the Joint Concert in Repps with Bastwick. The band is very grateful to Louth County Council who provided a grant to help with the purchase of this uniform. The contact with the Norfolk Broads Concert Band (NBCB) is a major part of the band’s history. In 2002, the conductor of the NBCB, Linda Purdy, saw our website and sent an Email asking if we were interested in a band exchange. After much contact, four members went on a reconnaissance and the first part of the exchange took place when Ardee went to Norfolk in 2003. The return trip took place in June 2004 and the memories of both trips will live long in the hearts of both bands.